I am processing the change of leaving one place for someplace new. Still. Here I am writing about it. Again. How long is this going to be necessary? Until I find more clarity. Until I no longer feel that this is not that. Until it seems like I have nestled into a settled sort of feeling. Nowhere near. I have hidden from writing because it forces the most honesty. When the words start to come, the truth arrives. Steps out from around the corner. It stares me down, reminding me that it is always there and won’t be ignored. It insists on being told. It stands firm and strong. There is no going around. I need to walk right up to it and embrace what it shows me. Nothing is a surprise. It is my truth after all. It is forceful. Unrelenting. It dares me to tell. Truth recognizes its own power to move us through. It doesn’t protect or fuss. It doesn’t hold hands, soothe us with comfort words or do half the work. It holds up the mirror, makes us stand up straight and look carefully. There is a lot I miss. Relationships. Deep connections. Knowing what is next. I miss feeling home. I miss being needed. Even the desperately needed that left little for me. Somehow, at the end of the day, I could always breathe again. I always found the energy to come back and do it all over. I miss never doubting that what I did mattered. I didn’t need to fix it all. I just had to be willing to try. That counted in big ways. “Imagine if I could just teach,” I used to think. But it’s always been the who and not the what in what we do that has meant anything to me. It’s still early days and I haven’t completely figured out who needs me how and if I know how to give that thing instead of another. It used to be mostly about love and attention and care. Those things first. Never judging the crying or the upset or the wild and the wooly. Being consistent. Being there. Showing up. Being strong. The things I need to do now, I needed to do then but it’s different. Plan. Teach. Organize. Somedays, there has been a lot of teaching. A lot of learning. Amazing learning. Exciting engagement. But I feel alone when I turn around to share it. I love to celebrate at the end of each day. I miss having the adult in the room who has weathered the storm with me and who agrees the smooth stone we hold up is completely beautiful even though we stepped through a lot of muck to find it. The muck made the beautiful parts all the more special. That we saw the beauty and not the muck made us all the more human. These days, there are not always storms. Sometimes though I am distracted by rocky edges. Sand that itches. Wind that turns me around. Sometimes, I kind of need a fix. I find myself drawn to any available chaos. The child not managing in the hall. The melt downs. It’s not trauma I seek. Or wish on anyone. It’s the formula of the challenge of deep inner city schools. Upset + making it through = reminders of how human we all are. Vulnerable, not perfect but trying our best for each other. Those rewards nourished me for years and years. It’s not about wanting to go back. I am truly gone. It is about recognizing what I miss. About trying to find new ways to give. It’s the giving that counted. I feel richest when I give deeply and celebrate often. Lately, I have been feeling a little empty. Truth sets a high bar. It reflects but it doesn’t tell. It shines but it doesn’t explain. It waits until we muddle about collecting the words, setting them down syllable by syllable willing them to tell the story of what we see. It won’t even nod its approval because we know when it’s right. When we can barely bare to say it without pulling it back or rushing to cover it up, then we know. We’ve laid it out. We’ve been brave. I am still tracking truth. Word by word, I find myself more on the road. 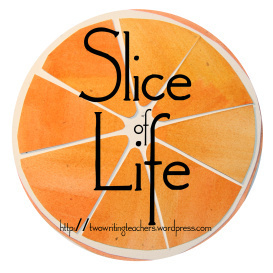 Last summer I wrote a lot of teaching related posts on this blog. I talked about classroom libraries, nonfiction books and assessment. I made countless book lists. I wrote to reflect, to make sense of things and to share. Looking back on those posts, it seems like I knew a lot and had much clarity around what I wanted to discover and figure out. This summer, I have been quiet. School related thinking has been about boxes and change and a whole lot of unknown. I have more questions than boxes and I had a whole lot of boxes. If I were to start a list of what I don’t know, I wouldn’t know where to begin and no idea where to end. I forget to breathe just thinking about it. Knowing and not knowing is full of confusion. I don’t know my students. I don’t know this community. I don’t know the routines and rhythms of the school. I don’t even know the full capacity of what I don’t know. My ignorance is a safety net. There are many things I couldn’t pack in those countless boxes. On the eve of the new school year, they swirl around me, reminding me that they won’t walk through the door with me tomorrow. They will nudge me to the corner and then stop and watch. I am on my own. Knowing I am without them. How strange it will be to walk into a school after a long summer break and not have children rush to me with happy smiles, big hugs and bubbly chatter. I will be other in a place I am wanting to belong. It has been so long since I have been a stranger. Knowing and not knowing is lonely. I have not brought histories with me. Knowledge and experiences of the dramas and the traumas we have lived through and learned from. I can’t hold up pieces of art, books from the shelf, photos from the wall and ask, “Remember this?” We don’t yet have memories. We don’t have favourites. We don’t have anything to smile back upon. Everything is about forward. Relationships are the ticket to everything. This, I know. Yet, tomorrow, I will walk in to this new school with no relationships. I did, however, leave many behind. I have walked from a blooming, bursting garden full of blossoms and prickly bits to stand in front of a patch of soil that looks, right now, just like dirt. Likely, it is full of unknown seeds that will begin to sprout. I need to discover the right balance of water, light and space. I need patience and faith. And time, of course. Always time. The comfort of what is known. I now wait in this strange place between knowing and not knowing. Ready to know new things. In the last weeks of school I was smiling. Often. Such a decision to leave after staying year after year. I had grieved months ago. I was ready to move on. Ready, while at the same time, firmly attached. I was asked this endlessly. I should have expected this question over and over and over again – being in the middle of leaving a place where parts of me are woven into the walls. Where parts of it are layered onto my skin, like extra pigment, invisible but discernible. Where particular children hold weight in my heart and have carved out acres in my memory. Working in my school was about so much. Showing up. Bearing witness. Keeping people safe. Caring deeply. I felt like every day I was handed leaf skeletons in a roaring windstorm and expected to keep them intact. I moved through days knowing that fragile pieces would break and tear away. I spent much time reattaching, repairing damage and having faith that we could heal a shattered mess. And then do more. Teaching was a part of what I did every day. Leader. Guide. Mentor. Yes, these things. But more often I was metaphorical items from the workshop. The glue. A level. A clamp. Quick drying cement. I carried stories, tricks and little bits of magic. Charms to help a silent child share. A broken child heal. An empty child begin to fill up. Responsibility. Urgency. Weight. These things nudged me, yanked me, shoved me through each day. At day’s end, I sifted through the moments and picked some to polish. To place on a table so the sun would find them in its warm, hazy, sure afternoon light. Leaving is not just finding another place. It is walking away from all of this. It has meant grappling with wanting to feel the happy and light of what is new while I know I am needed where I was. But I am giving away this guilt. Stepping out of a long gown heavy with layers and gathers. There is a noticeable thud when it hits the floor. I step out one foot at a time and stand firmly on solid ground. Sure. I let the layers float next to me before they drift away. I give my blessing. I have honoured this robe of time and history. I acknowledge that it has power to haunt me. Fiercely. I have accepted its strength. It has conceded that I will let it go. Pardoned me. Forgiven me. Letting me go too. We are gently, but certainly, releasing each other. I am beginning to be elsewhere. Oh these books of mine. These books need to be packed. I need a lot of boxes. These books. This collection has been the source of new words learned and new concepts understood. It has inspired countless art projects and drawings. Books in this collection have been favourites. Have been fought over. Have been held close and remembered. These books have given us words to talk about death, jealousy and prejudice. These books have shone a light on love, forgiveness and generosity. These books have made us laugh and rage and roar. These books have painted the sky, whispered the wind, suggested the rush of ocean waves, the quiet of midway from midnight, the warmth of a blanket lair. These books. I think about how they have entered my room. Most have been carted in by me. Book by book. Book by book by book. Books purchased on my book collection trips to the bookstores I love to visit. Frequently, my bright yellow backpack is full of books. Books and my lunch. Books and an extra sweater. Books and the shoes I will switch into when I arrive. But always books. I am a book pack horse. I walk, loaded down with pages but light with excitement at the prospect of sharing the stories I am transporting. Books have also arrived by post. Sent by publishers and beloved authors. Specially ordered when the bookstore didn’t have them. How many trips has our mailman made into the building with books for my classroom? Big boxes. Flat boxes. Bright yellow rectangles. Puffy white envelopes padded with bubble wrap and adorned with an array of stamps. These books. These books are each welcomed. Explored. Read aloud. They are relieved of their jackets. Labelled. Stickered. Put into the collection. They might be stolen away and hidden with attempted permanence into a child’s book box. They might be read daily for weeks and then sit on a shelf for months before being rediscovered. These books. These books. These books. I have been readying them for the move. Some need laminated covers. Some need to be weeded. Some will be left for other readers not taught by me. Some need to be read aloud, here, one more time. As I touch each one, I visit my read aloud memories or conjure the image of a child who read the book endlessly. These books. These books will be packed up carefully. The baskets and the bins will come too. I am hopeful for endless shelves but prepared that not every book will find a place to rest immediately. It will take time. These books. These books will stand with me when a new group of children meet me in a new room of a new-to-me school. Together. we will create a new reading space. Grow a new community of readers. In those times when I look up and remember that it’s all new and not yet home, these books will help me find my balance. Let me place two solid feet in the middle of it all. More like getting ready to pack. I am packing to go somewhere. Where? I don’t yet know. A year from now I will be settled into some other classroom in some other school somewhere in this city. At least that’s the plan. Job postings aren’t out yet. So I have no idea on most of this. I have two feet firmly planted in the day to day intensity of what I do. But I also have a few feet walking in circles in the land of unknown possibility. Pacing. Circling. Wondering. I have a toe reaching out to imagine other places. A younger grade? An older class? I have restless feet that don’t know how to be still. Clearly, I don’t have enough feet. My head is full of a soundtrack that I need subtitles to understand. Or a “how to think about it all” manual. Like swirling clouds on a fast wind, all of this speeds by while I stand in a frozen sort of limbo. I am no longer tethered to this place that has been such a part of my life. But as I don’t belong anywhere else yet, I am still so very, very home in this classroom, in this school, where I have worked for more than two decades. This is who I am. But soon, very soon, it won’t be. I still belong but I almost don’t. I am walking quickly on an unclear path. I am standing sideways where I have always been. I am twirling slowly looking for a new center. I am all kinds of lost. I go through the motions of beginning to pack. It is more about pretending to be productive. Attempting to find a movement train and jumping aboard. Packing right now is not yet about boxes. It is about sorting. About shifting – piles and energy. I stop often and just stand in the middle of my classroom and take it all in. Maybe somehow if I look at everything just the right way, I will find clarity. I need to know which way I am turning. It needs to be more than just away. Those unreal goodbyes need to begin. I will hold them tight and then let them go. We can’t really capture where we’ve been until we are pointed in a new direction. Just being in it is too murky. Too much of not yet. I feel dizzy standing still. Stepping into tomorrow is becoming more about the unknown than the known. One foot in front of the other. Moving away while still here. Looking at nothing through cloudy glass. I have called my little school on the downtown east side of Vancouver home for 21 years. A lifetime of sorts. Many little lives have been part of mine. I am a bat with ancient wings folded close. Black and leathery. Full of secrets. Lined in wisdom. Shimmering with history. I can stretch these wings wide and story after story shines bright, each one a most important star. Stories of children. Of families. Of hope. Heartache. Trauma. Resilience. Inspiration. My memories were gifted to me in hugs and giggles. Through whispers and shouts. Confided. Shared. Shouted. Hinted at. Memories visit me on a soft warm wind. They bring me smiles and worry. But mostly joy. In this old brick building, I have learned thousands of lessons. I have had hundreds of teachers. I have been surrounded by wisdom and wonder. I have made many mistakes. All of it has landed me here, knowing that I have some of it figured out and much to still learn. I haven’t heard it all. I can still be surprised. I can still be stopped cold. I can still feel like I’m floating. It is harder and easier and easier and harder. I am safe in that. There is security in knowing that what I bring each day is enough in the land of never enough and so much need. Everyday, I give. Everyday, I get. It’s not about balance or equal shares. It’s about what it is. In September, I will not walk through these halls I have long called home. I will be somewhere else. I will not be gone. It’s not moving on. It’s not leaving. It’s beginning somewhere new. The teacher I am was made here. All of it will follow me. All of it will guide me. As I begin to say goodbye, I acknowledge this.